Past three months every day I have a constant dull ache in my shoulder and in my left arm. Sometimes it varies to where it feels sometimes like it's in the top of my shoulder/collarbone to sometimes on top of my arm, sometimes it's around my elbow and can even go as far as my wrist especially when I'm driving. It first happened when I was at work because I'm a nurse and my day to day involvement includes moving and handling, however even after taking 2 week off work to rest I'm still no better. I cannot lay on my left arm as the ache gets more intense, when I stretch out my arm underneath feels a pulling sensation. I've have been to doctors 3 times and still not resolved this issue. First doctor said it was strain and to take anti inflammatory medication (doesn't help); the second doctor said it was a trapped nerve and prescribed me medication which hasn't released it and the third one now has referred me to physio which I'm so worried about as nobody has actually sent me for any tests or scans; just checked my range of movement in my arm which I have full range and checked for arm swelling which there isn't any. I'm only 23 I shouldn't be feeling like this for such a young age. Three months is certainly a long time to have no diagnosis; especially of a nurse; I'd assume they'd take special extra care of their own. Katie, you make no mention of neck pain; if you turn your head to the left and simultaneously look up, does it provoke anything? This is called Spurling's test. Do no movements of the arm and shoulder provoke the ache? Did any of your doctors take a reflex in the arm, or test for numbness? Prick you arm with a pin, and compare with the right arm. The test for a pinched nerve in the neck is called the upper limb tension test; type that into the Site Search function at Chiropractic Help; you'll need a friend to do this test. Let me know the result. 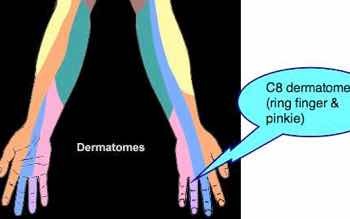 Locate the radial pulse in your left wrist with your right hand; turn your head to the left, look up and take in a deep breath; does it change the pulse? With your left elbow at your side, bent at 90*, press in and pull out against the resistance of your right hand; without moving the arm. Does it provoke pain? This is called an isometric test for a muscle tear, or tendonitis. These are the kinds of tests that a chiropractor would do; they should be done first before expensive tests or x-rays requiring the use of ionising radiation. Let me have some answers. I have been having the toothache pains in my shoulders, arms, and right leg, for 2 years. I take pain pills 800 ibuprofen to ease the pain; my right legs hurts so bad and a burning hot feeling comes on I have to sit down before I fall down. When my shoulders hurt it brings me to tears; the doctor said it's coming from my back pains, spinal stenosis so I applied for disability a year ago. I have no insurance, so I'm just waiting, and taking pain pills. You're in a tough place, but taking out no medical insurance, remember you are many thousands of dollars ahead, and it's now time to consider spending those savings. Just taking pain pills doesn't treat the cause of your pain and will give you an ulcer and ruin your kidneys. What's really needed here is an accurate diagnosis. Is the pain in your shoulders and leg radiating pain from your neck and spine, or are they local problems? Chiropractic Help is about aiding you to help yourself. Look for the shoulder and lower back exercises and do them diligently every day; start gently, the Winter Olympics are over! Take a walk or swim every day. If you're on an inflammatory diet of fast food, french fries and refined carbohydrates, then it's time to change your ways. If you need to lose a significant amount of weight, get it off; or suffer. Do some studying of the meaning of resistant starch and glycemic index; apply your mind. With no insurance you have to help yourself. Writing this letter is a very positive first step; it means you are really tired of pain and pills; that's where change of lifestyle begins. Good luck and I hope this contributes. I got my results. My EMG shown that their is pressure on one of my nerves from my neck. The pain has fully gone now though. I have no clue why? Maybe you could explain how it fixed itself? I do feel a dull ache on the top of my shoulder from time to time but it is nothing compared to what I had. Anyone scared about going for an EMG, don't be. It is pretty painless apart from the jolts you feel. Also the needle is not that bad at all. Forearm is worse but bearable. Think of a cat scratch. Nothing to worry about. Hello Daz, this will be helpful to others; thank you. The body has amazing healing properties, given time and common sense. Now just be sensible at the gym. The Winter Olympics are over and it's early to start training for the next one! Otherwise the pain will just come back. Thank you doctor B. I have not been for my tests yet but the pain is really weird. It does not hurt half as much now. I even coughed the other day and thought something was missing. It then hit me that was my first cough in about two months with no pain. I have started going to the gym again, at first it hurt but it seems to be helping my arm a lot. Like I say it is really weird. I will post back my results from the tests to try help anyone experiencing the same. If this is a pinched nerve, and I suspect it is, then stretching out the arm will aggravate it. Be really careful at the gym and listen to your body. It's great that you seem to be improving. Did you get it sorted? Did you ever get the problem diagnosed Katie? I have the exact same problem but on my right. I have told the doctor before the pain is hard to describe but at best like toothache in my arm only to get a bewildered look, I am so thankful I typed Toothache pain in arm in Google and know it is not in my head. I have an Electromyography next month, which to be honest is far too long as the pain is getting worse, I can not sleep as good and sometimes I have to go home from work because the job I do is physical. I hope you have got a diagnosis and got it sorted, if you have and see this please let me know. Thanks Daz for your comment; we'll see what Katie has to say. Meantime, an ache in the arm is often the sign of nerve pain. Try to work out which movements provoke the toothache type pain; moving your arm, neck, shoulder? Nobody has tested me for any of the things above. On movement the pain intensifies and I've just tried the rest of bending my elbow and the ache radiates. I sometimes get the sensation of pins and needles / heat in my arm on movement. I'm happy that you understand from the profession point of view I'm quite frustrated. I know personally that everything what is going off with me is not normal, I've even suggested to the dr about ultrasound scan to rule out any trapped nerve as I also do have neck pain when I look to the left on occasion but I feel like I'm in a plastic box shouting and nobody's listening to me, I've tried every over the counter medication before I even went to see the doctor on first occasion in February yet the last time I went which was on Friday he ended the conversation with self refer yourself to physio and start taking ibuprofen for 1-2 weeks and I felt like screaming at him then. It doesn't help seeing 3 different doctors all about the same problem. The truth is you've been neglected, Katie. Your doctors are either out of their depth, or idle or both. You are probably not paying for that medical care, so they couldn't be bothered to stretch themselves; I have to guard against it myself when treating friends, family and colleagues. It's sheer neglect not to have taken at least a reflex. You know when you've been properly examined, and when you're being fobbed off, so it's little wonder you are frustrated. You say 'with movement the pain intensifies' but you don't say movement of what; neck, shoulder or lower arm? You certainly have lower neck problems and when the shoulder is not properly innervated, then strains in the muscles occur on top of the spinal issues. I suspect from what you describe that this is both a neck and shoulder issue, and perhaps a thoracic outlet involvement of the first rib, clavicle and scalenes. Both physios and chiros often have far more knowledge of these issues that the average general practitioner; we work with them every day, they see them only occasionally. In these circumstances, I think it might be best to ask for a referral to an orthopaedic surgeon; talk first to folk, colleagues and find out who comes strongly recommended; I wish you luck; it's a minefield.